After 25 years of holding the Narrow Gauge South-West show in Shepton Mallet, the organisers (the Small and Delightful Railway Group) announced that this year's show would be the last. It's not a show I've managed to attend often, being a fair trek from here, but I exhibited Awngate their a couple of years back, and really enjoyed it. With the final show promising to be super-sized with around seventy layouts (yes, really), I decided it was worth making the effort! 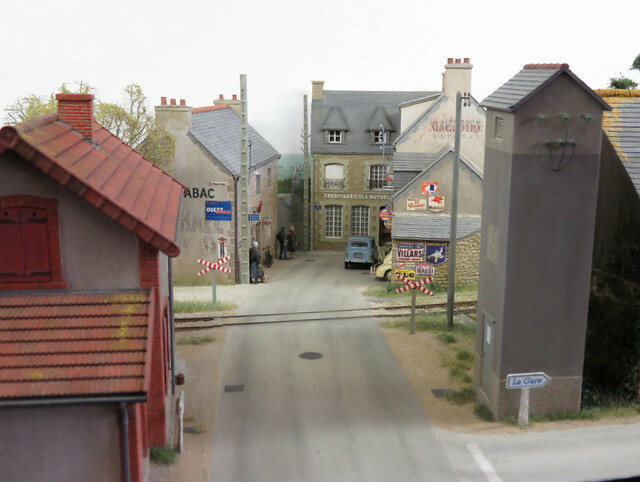 One of the stars of the show was Pempoul, a stunning model of French Narrow-Gauge in 1:50 by Gordon and Maggie Gravett. 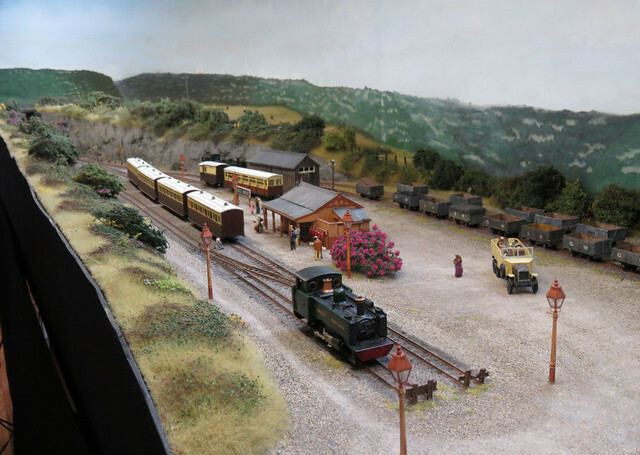 Bridport Town and Charmouth by David Taylor is a well-known O-16.5 freelance model, that has featured in Railway Modeller, with that difficult to find "atmosphere!. Devil's Bridge by Eddie Field is a relatively new layout in 009, capturing the feel and space of the prototype really well, set in an earlier era. 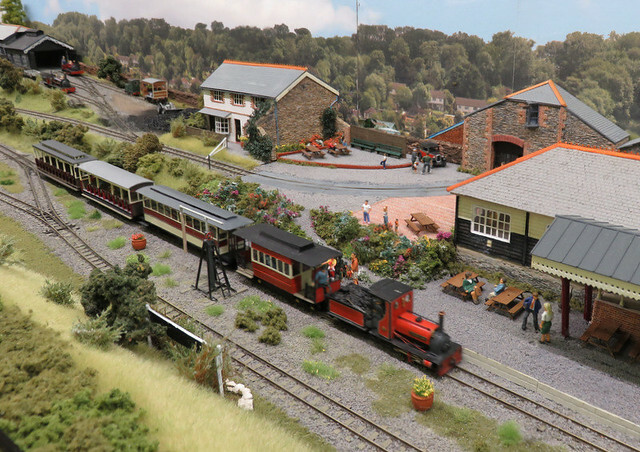 Another new prototype 009 layout but set in the present day was Launceston Steam Railway, by Richard Holder - instantly recognisable to anyone who has visited the line, and modelled to a high standard. 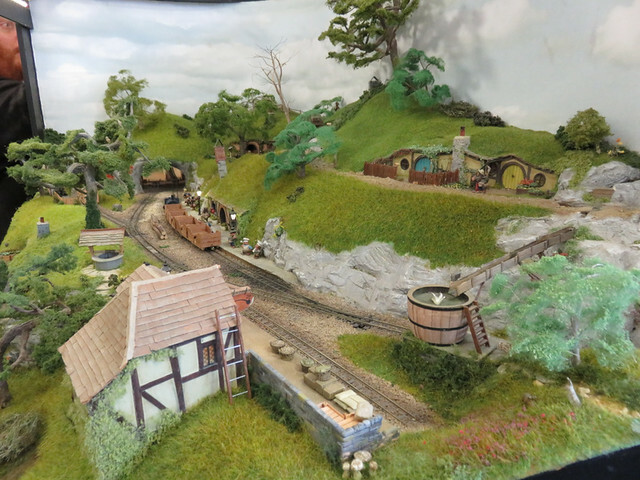 At the other end of the fidelity scale was Hobbiton End, a model of Middle Earth in 5.5mm scale by Simon Adelsee. Obviously built with a sense of humour, it has also been built with much thought to get the "feel" right, and to a high standard of modelling too. As well as browsing the show I spent a couple of hours helping my friend and Sussex Downs group member Martin Collins with his superb 009 layout, Llandecwyn. With so many (excellent) layouts at the show I can't go over them all here, but I can say the trip was well worth the effort - and with the bonus of chatting to many familiar faces too. But if you do want to see more, there's a large set of photos here. It was a brilliant show. Loads of fascinating models!